With a name like The Cake Chica you would be safe to assume that I have a little bit of a sweet tooth. But at the same time, I am also very health conscious. So I always make sure to balance out my meals in a way that I never feel deprived. 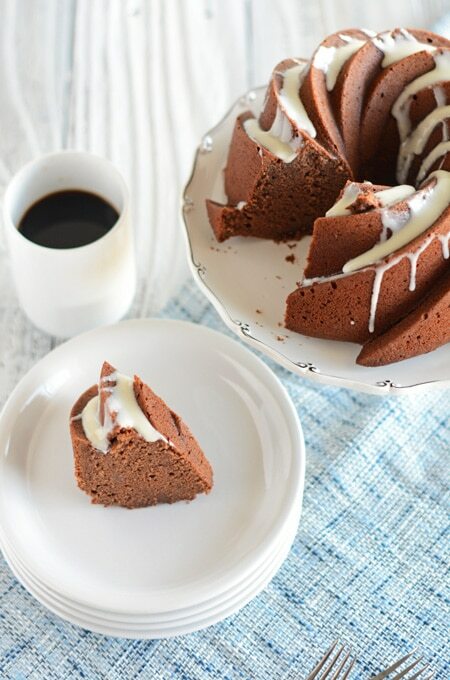 This Healthier Chocolate Coffee Cake is the best of both worlds. When I was young, maybe 8 years old, I would stay with my Grandma Mary for summer or during the weekends, and she would always have something sweet for me after almost every meal. I miss those times where people had a more balanced diet of simple foods and portions were in control. Nowadays it’s so easy to overeat. With most restaurants these days serving you food that should feed two people that only needs to feed one. But living a balanced lifestyle doesn’t have to be hard. Knowing that I don’t have to deprive myself of certain foods makes this balanced lifestyle pretty easy actually. 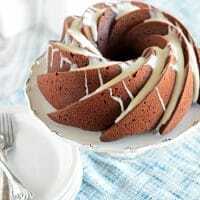 So have no fear, this Healthier Chocolate Coffee Cake is rich in flavor and light in calories. You’ll only think you’re indulging! Set oven rack to the lower third position in the oven and heat to 350 degrees. 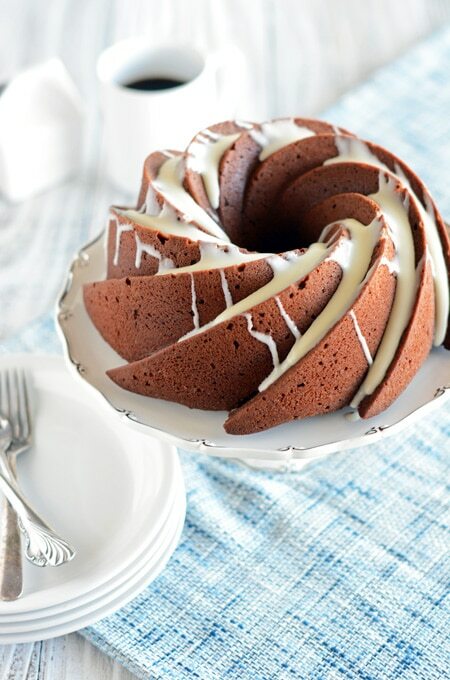 Coat a 10-inch tube or Bundt pan with baking spray and set aside. In a medium-sized mixing bowl, sift the flour, cocoa, baking powder, and salt. Whisk to combine. In the bowl of an electric stand mixer, fitted with the paddle attachment, beat butter, granulated sugar and brown sugar together until well combined on medium speed for about 1 minute. Beat in the egg whites and the eggs, one at a time. Scrape down the beater and sides of the bowl as necessary. 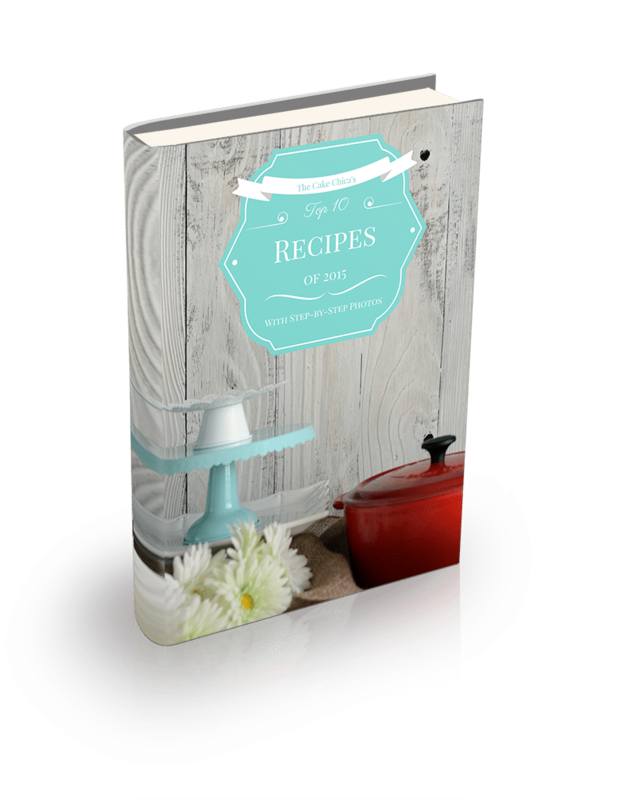 Whisk together the buttermilk and coffee in a large measuring cup with a pour spout. Beat a third of the dry ingredients into the batter on low speed, and then beat in half the coffee-buttermilk mixture. Continue beating until the coffee-buttermilk mixture is absorbed. Then repeat with another third of the dry ingredients and the remaining coffee-buttermilk mixture. Scrape down the bowl and beater if necessary. And finish with the remaining dry ingredients. Beat batter for about 3 minutes on medium speed. Pour the batter into the prepared pan and smooth the top with a rubber spatula. Bake for 50 to 60 minutes, or until a toothpick inserted in the middle of the cake comes out clean or with a few moist crumbs. Cool in the pan for 5 minutes, and then invert the cake on a cooling rack to cool completely. In a small bowl, combine all ingredients and stir vigorously with a rubber spatula until smooth. Adding more cream if necessary. Pour the glaze into a measuring cup with a pour spout or a piping bag and snip a tiny hole on the bottom corner. Drizzle the glaze onto the cake and let sit for 10 minutes before serving. Be sure to make this glaze right before serving as the glaze will harden as it stands. Nutritional information is without glaze. This sounds delicious! 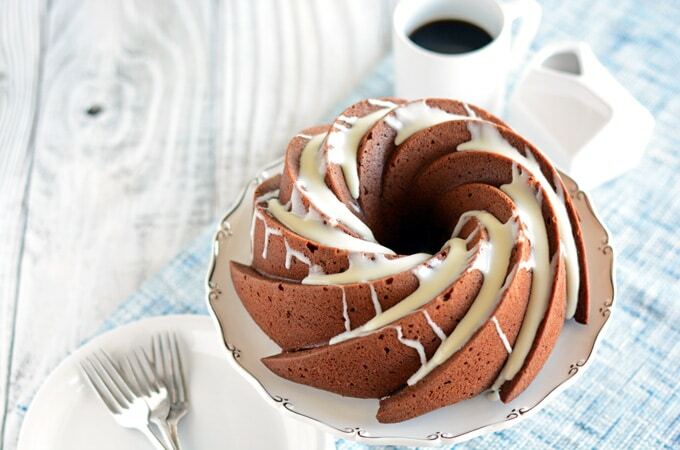 I love coffee cakes, and the pictures look amazing. Healthier means that I can have two slices, right?